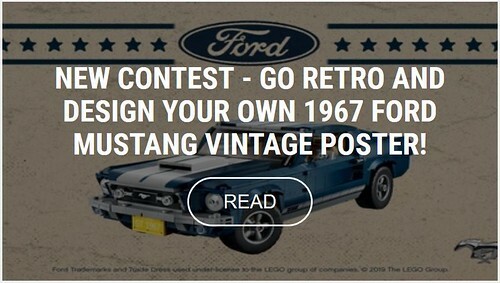 Ideas has a new contest centered around building a poster advertising the 1967 Ford Mustang. "The 1967 Ford Mustang - an American legend and a true classic! To honor this beautiful classic, we’re looking to see your original take on a vintage poster featuring a 1967 Ford Mustang. So, show us your very own design and be sure to incorporate that vintage, retro look and feel to your poster oh and of course it should be built in LEGO bricks!" The contest is open through April 3rd, 2019 at 6:00 a.m. EST. Submit your entry and find the full details on the contest page.